What could be better than a wire heart ring? 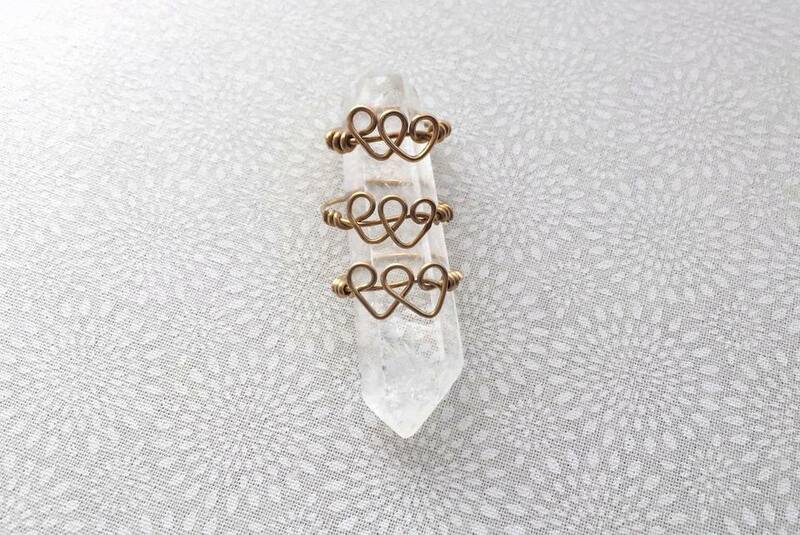 How about a wire ring with two connected hearts! This DIY wire ring project is well suited for an advanced beginning wire worker–unless you are willing to practice a few times to make it even. If you are brand new to making wire jewelry, this single wire heart ring is a better place to start. This project only requires standard wire jewelry tools, but if you have a wire jig, you should use it. Jewelry making jigs are a great way to craft even wire shapes, and duplicate the same shape. The examples in this project use jeweler's red brass wire, which is a good option because it is slightly stiffer than copper or craft wire. If you are using copper wire and 20 gauge seems too soft to hold shape, switch to 18 gauge wire. The precise amount of wire you will need depends on the size ring you will be making. Plan to use about seven or eight inches of wire for each ring. The wire heart motif consists of a simple loop, a V shape, and a second loop to form each heart. The center loop is used for both hearts and is what makes them overlap. About 1.25 inches from one end of the wire, make a simple loop. In order to keep each loop even in size, mark the spot on the round nose pliers where you made the loop. Sharpie permanent marker works well for this, or I like to use rubber jump rings called Oh! rings. I slide the thin rubber rings onto my pliers and it helps guide where I should place my wire. Snug your flat nose pliers just under the loop and bend the wire to a right angle to make the V center of the heart. You will have the most flexibility if you are using flat nosed pliers with tapered jaws, since you can decide which part of the jaw to use to make the bend. You can mark the spot used to bend the wire with the same method used for the loop you made with the round nose pliers in the last step. Complete the first heart by making a second loop, aligning your wire on the spot marked on the round nose pliers. Try to make sure the loop will line up with the first one you made. Using your flat nose pliers, bend the wire into a V matching the first one. If you marked your pliers, it will be easier to make it the same size as the first. Complete the second heart by making a final simple loop. Make sure to cross the wire the same way as the first loop, i.e. either over or under the wire from the center of the heart. Straighten the wires on the side so they are smooth and going straight out to the side. These will be used to make and secure the ring band. If desired, you can lightly hammer the wire hearts on a bench block. This will help stiffen the wire and keep the design from changing shape while you are manipulating the band. Hammering will also flatten the wire, adding little reflective surfaces that makes the ring glimmer in the light. Do not hammer it too much or the wire can break where they cross over each other. Shape the ring band by wrapping it around a ring mandrel or other round item of the appropriate size. Press the wire firmly against the mandrel and hold it in place. If the wire springs out to a larger size, you may need to wrap it a little smaller than the desired size so it keeps the size you want when you remove it from the mandrel. Bend one end of the wire at a right angle over the band, close to the edge of the heart. You will wrap the wire around the band two or three times to secure it in place. After each wrap, use the pliers to push the wraps close together and keep them as neat as possible. Trim the wire end with the flush cutters. Try to trim it so it is at the bottom of the band where it will not scratch you or get caught on clothing. Smooth the wire end with a jewelry file or nail file. Repeat these steps with the wire on the other side. Before starting the wrap, make sure the ring size is correct, since you will be unable to adjust it smaller once the second wrap is done. You can make the ring slightly larger by placing it on a ring mandrel and lightly hammering. Once all the wires are wrapped, trimmed and smoothed, you can wear or gift your double heart ring. An alternate method to make this ring is to use a wire jig to make the hearts instead of pliers. This is a perfect beginning wire jig project.